Learn how colleges notify you about the types of financial aid you qualify for, and the next steps. Part 5 of the FAFSA Demo shows you how to transfer tax information into your FAFSA. Part 2 of the FAFSA Demo tells you how to add your high school and up to 10 colleges to your application. Part 4 of the FAFSA Demo shows you how to add parent information to the form. Part 1 of the FAFSA Demo explains how to log in and add personal information to your application. Part 3 of the FAFSA Demo explains dependency questions that will determine if parent information is required on the form. A college education changed Tracey’s life. Are you up for the challenge? Need a friend to help you overcome challenges in getting to college? Meet EducationQuest. Not sure how to plan or pay for college? Meet EducationQuest, your new friend in college planning. What does it take to make a FAFSA? The perfect meal takes time and preparation, just like the FAFSA. Find all the ingredients in our FAFSA Checklist. To get financial aid for college, you need to complete the FAFSA – which requires an FSA ID. In less than 90 seconds, learn how to get one. Do it. Track it. Earn it. Your involvement now will help you earn scholarships later. 4 Ways to Pay…for College! In this fun, fast-paced video, college students Derrick, Jasmine, Chase, and Sara demonstrate the four types of financial aid. To learn more, visit EducationQuest.org. Find the right fit for college. Use our free tool to find colleges in the U.S. that meet your criteria. 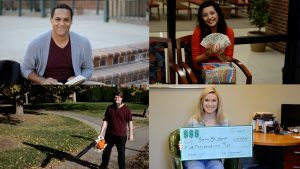 Learn how students put their hands on cash to help pay for college. Do you need to add more colleges to your FAFSA, or use IRS Data Retrieval to add official tax information? If so, watch this video. Learn how students found help to get to college. Learn how students found the right college and career for them. Help Me With Student Loans! Traelon’s younger brother needs help figuring out his student loans. Can Traelon help him? Schedule a campus visit to find the right fit for college. Click here for campus visit tips. Meet the deadline or terrible things might happen! Check your email, mail or college online portal – often! Learn about the steps you need to take to apply for student loans. Take tough classes in high school to prepare for college. Hey, Mom…it’s time to complete the FAFSA! Selected for verification? Learn what to expect. Tips on how to complete a winning scholarship application. Tyler's future includes a journey to college. EducationQuest will help him along the way! Sara has a dream of going to college. EducationQuest will help her get there! Tracey had a job that was going nowhere until she earned a degree. Cordara learned the hard way that education is the key to a better life. EducationQuest is helping Cordara succeed in college. We can help you, too! Student ambassadors explain the four steps needed to make college a reality. Take Biology in high school – it’s not as tough as it seems! It’s cool to learn a foreign language and it will prepare you for college! Algebra II may be tough, but it’s not that tough – and it will prepare you for college! Follow two seniors through the process of finding a college that best fits their interests. Two friends visit their old high school and "flash back" to decisions that impacted college. Dream big and you can make college a reality. You have what it takes to make college possible.